Few destinations in Mexico dazzle visitors quite like Cancun, a modern resort town filled with glitzy hotels sitting on picturesque and well-developed Caribbean beaches. Escape the urban bustle at Scuba & Snorkeling and Akumal Beach. Venture out of the city with trips to Playa del Carmen (Zipline & Dolphin Discovery). There's much more to do: fulfill a lifelong dream with a swim-with-the-dolphins experience, make a trip to Avenida Kukulkan, tour the pleasant surroundings at Playa Delfines, and contemplate the long history of El Rey Ruins (Zona Arqueologica El Rey). To find ratings, reviews, and more tourist information, go to the Cancun trip itinerary planner. Cincinnati, USA to Cancun is an approximately 10-hour flight. In March, Cancun is much hotter than Cincinnati - with highs of 82°F and lows of 69°F. Wrap up your sightseeing by early afternoon on the 19th (Sun) to allow time for travel to Mexico City. Explore the numerous day-trip ideas around Mexico City: San Juan Teotihuacan (Zona Arqueologica Teotihuacan & Pyramid of the Sun). 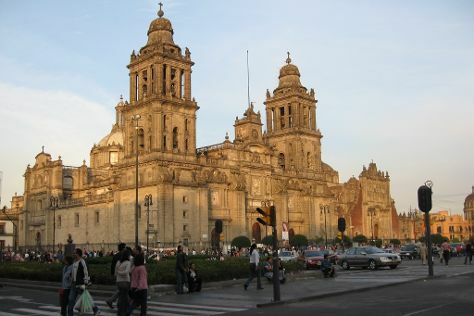 There's much more to do: examine the collection at National Museum of Anthropology (Museo Nacional de Antropologia), get to know the fascinating history of Zocalo, explore the ancient world of Metropolitan Cathedral (Catedral Metropolitana), and get a sense of history and politics at National Palace (Palacio Nacional). To see maps, where to stay, ratings, and more tourist information, go to the Mexico City vacation builder. Traveling by flight from Cancun to Mexico City takes 4.5 hours. Alternatively, you can take a bus; or drive. The time zone changes from Eastern Standard Time to Central Standard Time, which is usually a -1 hour difference. Expect a bit cooler temperatures when traveling from Cancun in March; daily highs in Mexico City reach 75°F and lows reach 50°F. You'll have a few hours on the 24th (Fri) to wrap things up before traveling home.